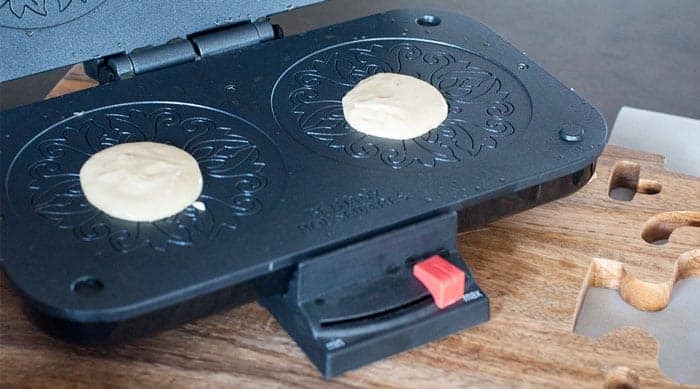 Learn how to make Krumkake, a Norwegian waffle cookie traditionally served during Christmastime. This how-to includes a list of supplies needed, ingredients, and tips. 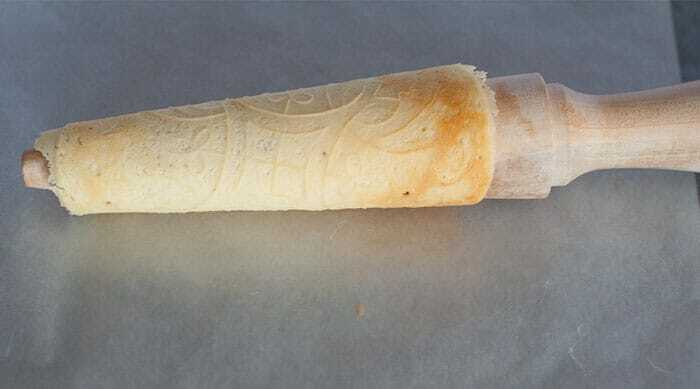 Krumkake is a delicate Norwegian waffle cookie. Pronounced [kroom kaka], the plural being Krumkaker (which is something new I learned this year!). Try teaching a 2-year-old how to say Krumkake, it’s hilarious! If only I would have caught it on video when my son was repeating “Krumkake” while I made it this year. It’s one of my favorite Norwegian treats. Along with almond cake and lefse. 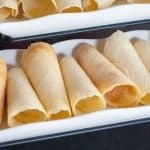 Krumkake is also one of the easiest Norwegian treats to make, in my opinion. This particular recipe has nutmeg which adds so much to the flavor. Be sure to set aside a good chunk of time to make this recipe. Making the batter goes really quick, but the baking and rolling take some time. 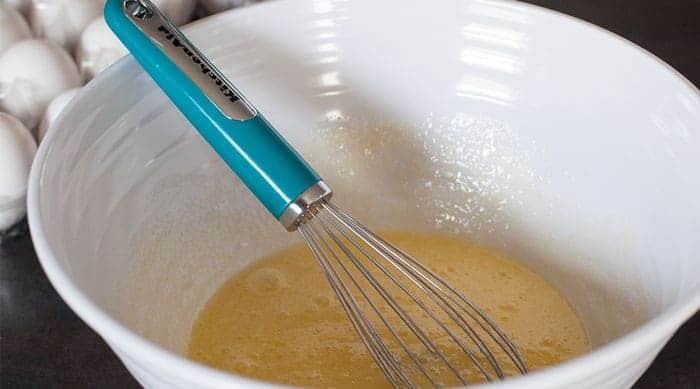 Begin by beating the eggs and sugar until lemon colored and light. Next, mix in the melted butter, salt, nutmeg, vanilla, heavy cream, and flour. Look at those beautiful specks of nutmeg. Pre-heat your krumkake iron. Drop by spoonfuls onto each side. 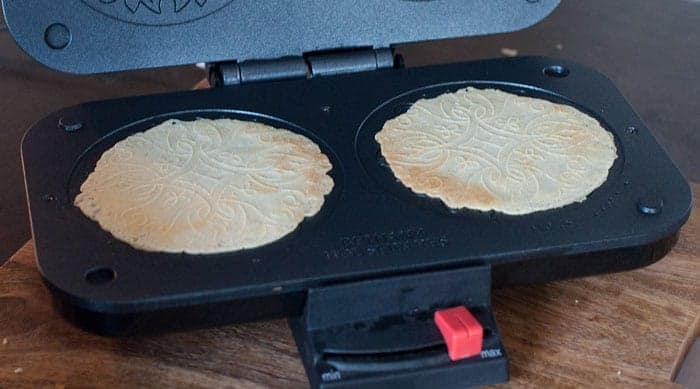 Cook until the krumkake is light brown. Remove the cookies carefully and roll with a krumkake roller. It helps to have a rolling tool with a handle. Growing up I remember making them with just the cone shape (no handle) and also one that was metal. And let me tell you it was not easy on the fingers! So definitely look for one that is wooden and with a handle. After rolling, press down for a few seconds to “seal.” Be sure to roll before the cookie cools. It hardens pretty fast. If you have a few people to roll — even better! Store until you’re ready to serve. Holiday tins work great. Some people pipe the inside with whipped cream or flavored filling, but these cookies taste great all by themselves. Overall a pretty simple recipe as long as you have the right tools. I hope you enjoy! A traditional Norwegian cookie. Popular at Christmastime. Beat the eggs and sugar until lemon colored and light. 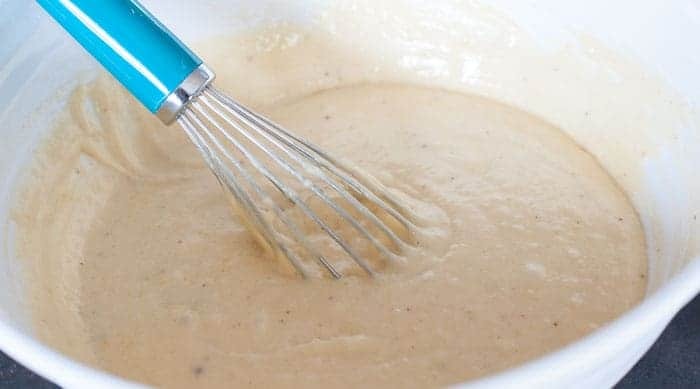 Mix in the melted butter, salt, nutmeg, vanilla, heavy cream, and flour. You may need to press down on the iron a bit if your iron does not have a clamp. You want the cookie to be fairly thin to roll. 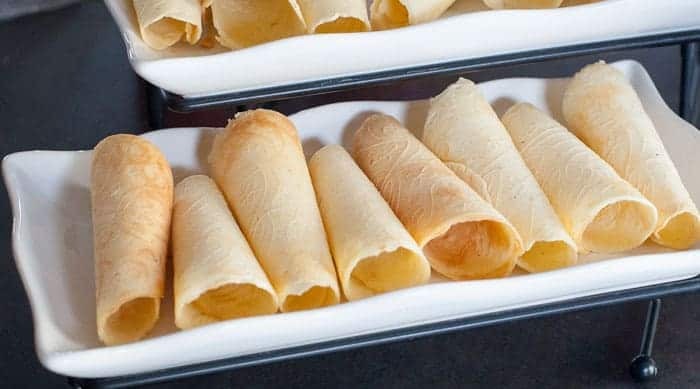 Remove and roll with the krumkake rolling pin. Be sure to roll before the cookie cools. It hardens quickly. I always use Cardamon in my Krumkake instead of nutmeg. Interesting, I’ve never used Cardamon. Thanks for stopping, Shannon! I just ate dinner but my mouth is watering. I love the Norwegian food that you feature. My wife and I will definitely be making these over the next few days. They look delicious. Thanks for sharing!!! Thanks for stopping! I hope you had a wonderful Christmas weekend.